Cottage with a white paling, 1648. Landscape with a cottage in a typical Dutch rural life, surrounded by a wooden fence. Image size is 13 x 15,8 cm. Cottage with a white paling (B232), 1648. Etching and drypoint, state III(3). Image size is 13 x 15,8 cm. This is one of the rare landscape etchings that Rembrandt based on drawings. These drawings are now owned by the Rijksmuseum. The etching has a number of typical details of rural life not seen in the drawing and the cottage is now set in a wider landscape. 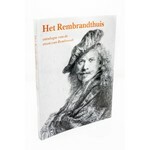 How do we make the most beautiful reproductions of Rembrandt's etchings? First the etching is photographed. The best photograph is transferred to a copper plate which is covered with a special layer to make it sensitive to light. All the unexposed areas in this layer where black lines occur can then be washed away. The copper is exposed and grooves are created when the plate is subsequently immersed in a bath of acid. While looking through a stereomicroscope the engraver cuts the lines in the plate by hand. He uses a sharp burin and works with meticulous care, constantly comparing his work with the original, following the hand of Rembrandt. Once the plate is ready, it can be printed. The final result comes very close to Rembrandt's original. It is as if the master himself has been at work. The etching is sent to you without a mount (w.m.). If you would like the luxurious version including a mount you can make that choice with "make your choice" and put it in your shopping basket. The mount is cream coloured, 30 x 40 cm.